A quarterback in high school, Carmichael shifted to wide receiver in college. With concerns about his tall but lean frame being able to hold up in pro football, he was chosen by the Eagles in the seventh round of the 1971 NFL draft and spent the first two years of his career being tried at tight end as well as wide receiver and missing time due to injuries. He caught a total of 40 passes in 1971 and ’72 for 564 yards and two touchdowns. With WR Harold Jackson traded to the Rams for QB Roman Gabriel, and new Head Coach Mike McCormack committing to Carmichael at the open wide receiver slot, he broke out in ’73. In combination with 6’3” WR Don Zimmerman and 6’4” TE Charle Young, he became the tallest member of the “Fire High Gang”. Eagles went 5-8-1 to finish third in the NFC East while leading the NFL in passing yards (2998). 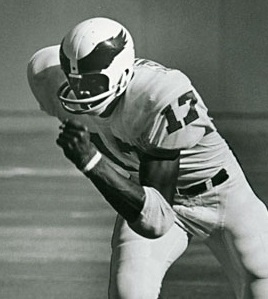 Carmichael’s pass reception and yardage totals in 1973 remained his career highs, but he continued to be a key element in Philadelphia’s offense for another ten seasons. Lacking speed, Carmichael used his height and dependable hands to good advantage, and was difficult to bring down in the open field. He caught 56 passes for 649 yards and eight touchdowns in ’74, garnering second-team All-NFC recognition from UPI. After three seasons of less than 50 catches with a club that struggled on offense, Carmichael had 55 receptions for 1072 yards (averaging a career-best 19.5 yards) and 8 TDs in 1978, the first of two consecutive years in which he received first-team All-NFC honors and three straight in which he was chosen to the Pro Bowl. He had a career-high 11 scoring receptions in ’79, the same year in which he broke the record for consecutive games with pass receptions, a streak that eventually reached 127 and served as a testament to his durability as well as reliability. Carmichael departed the Eagles after the 1983 season holding club records with 589 catches, 8978 receiving yards, and 79 touchdowns. He appeared in two games with Dallas in 1984, his last season, and caught one pass for seven yards to top out his career total at 590, which ranked fifth in NFL history at the time. Carmichael received first-team All-NFL recognition once, first- or second-team All-NFC honors after five other seasons, and was chosen to four Pro Bowls.